I've read the research, but after putting an infra red heater on my deck and getting a bit sunburned, I'm thinking I CAN get sunburned from it..... Any one else experience sunburn from these heaters? Every now and then you will have people who are asking about the dangers of an infrared sauna and the dangers of potential sunburn when using an infrared sauna. Many infrared sauna vendors publish information on their websites about how infrared saunas are safe to use because the energy they emit is the same type of energy that is also emitted by the sun. That particular piece of information sometimes confuses people, because when they hear “energy emitted by the sun”, they immediately think “sunburn” and “harmful UV rays”. This misconception is totally logical, but it is important to understand that the sun emits energy in a spectrum that is extremely much wider than the energy spectrum that we typically find inside an infrared sauna. The spectrum that the sun emits includes X-rays, gamma rays and cosmic radiation, but also energy in wavelengths that include visible light. In addition to that, the sun also radiates other types of energy with wavelengths that are invisible to the human eye. Immediately *below* the visible spectrum, we find wavelengths that are *longer* than the wavelengths of visible light. This is energy with *lower* frequencies (the longer the wavelength, the lower the frequency) and is what we call the infrared spectrum. Completely at the *other side* of the visible spectrum, we find the energy with shorter wavelengths and higher energy levels (higher frequencies) that are invisible to the human eye, namely ultra-violet. As you may know, visible light also happens at different frequencies, which is demonstrated in the colors of the rainbow. Red light is at the long-wavelength end of the visible spectrum and violet is at the shorter-wavelength end of the visible spectrum. Infra-red (with the word “infra” meaning “below”) is indeed invisible to the human eye, because it happens “below” the frequencies of red light, whereas ultra-violet (with the word “ultra” meaning “above”) is situated “above” the violet light frequencies. All this might be rather technical to digest, but what it comes down to is that in the wavelengths spectrum, the energy emitted by infrared saunas is separated from the harmful ultra-violet rays that can cause sunburn by our entire range of frequencies of visible light. Thus we shouldn’t worry about getting sunburns in an infrared sauna. What could be happening though, is the effect we sometimes see as a result of vasodilation (expanding of the blood vessels). As a result from the infrared energy, our blood circulation beneath the surface of our skin increases, which can potentially lead to our skin turning slightly red. You could compare it with blushing, as this is also the result of increased blood flow in our face. Susan, I also noticed that you mentioned using an infrared heater, not an infrared *sauna*. If you are talking about a typical infrared heater (which is rather used to warm people in cold environments), it means that it’s most probably a near-infrared heater (as opposed to a far-infrared heater), which would also explain the turning red of your skin. Getting into detail about the differences between near infrared and far infrared would probably get us even more distracted, but if you want to find out more about this, you can read this page about near and far infrared. I apologize for the long and technical explanation, and I certainly don’t want to discourage people from chiming in on what Susan was asking about. So if anyone wants to comment on Susan’s question about sunburn in an infrared sauna, please feel welcome to do so. Comments for Sunburn from infra red heaters? 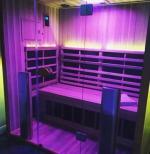 I have a new Infrared sauna and notice redness after use. I am 49 and not sure if this a dryness in my skin. My face, particularly the delicate area around my eyes, is becoming red almost like eczema. I have been trying to supplement with omegas. Any suggestions helpful. Should I coat skin with moisturizer before using? Usually oily t-zone.